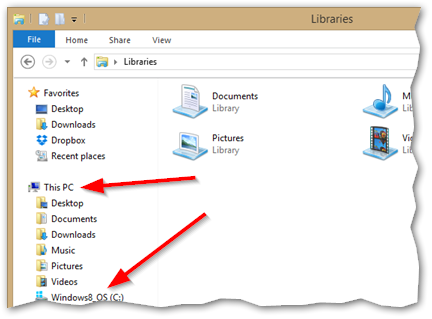 I was arranging my folders in the Libraries of Windows 7, following the method in the attachment below. Inadvertently, I lost everything in the default library 'Documents'. The library itself is intact but when opened, there is nothing there; only the message "Documents is empty". How can I rectify this? 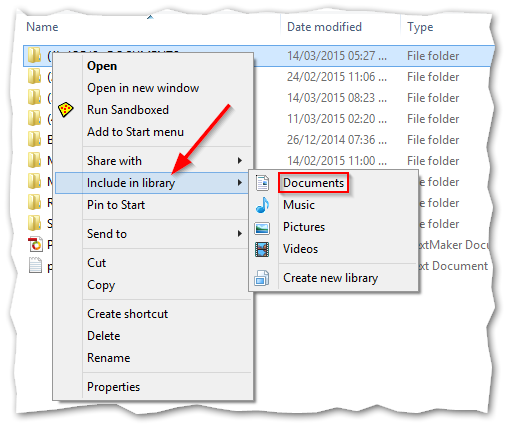 Right-click or Shift-F10 on the Documents library folder and select "Properties". You can use the "Restore Defaults" button to return to the original documents folder. e.g. on Windows 8 it will be "C:\Users\username\Documents"
Melita, lets hope your files and folders are still there but in the meantime don't run any programs or do anything that might overwrite the files/folders in case you've really deleted them. The instructions in the image you posted are for removing "Symbolic Links". Let's hope that's what you did. Okay, let's get down to seeing if your files and folders are still there, and if so, "restore" them to your Documents Library. Note, if you find my screenshots look a bit different that's because I'm on Windows 8.1, but they should look familiar enough to guide you. Make sure My PC is expanded. It may be called My Computer or Computer in your own system. Assuming you keep your files there, click on the C: drive. Open the folder with your username. Hunt around and see if you find your files/folders. Once you find them, right-click on each file/folder and select "Include in library → Documents" or whichever library you want to include it in. In case you don't know, it's possible to include a file/folder in more than one library with this method. I hope find the missing items and the above solves your problem. If not, please let us know. Melita, it would be really helpful for others, if you provided the link to the webpage from where you were following the instructions, so that the people trying to help you can understand the issue fully, and also see at the article in full to get the big picture. Both of your methods work fine. Thankfully, everything is there in 'Users', 1. My Documents and 2. Public Documents. If I go for the default arrangement of Windows, I can just include these two default folders 1 and 2, in 'Documents' and be done with it. Else, without doing that, I could include each folder separately from 1 and 2 in 'Documents'. Everything available with one click on 'Documents'. To make up mind, could you please tell me the purpose of the arrangement of Windows where 1 and 2 are included by default, within 'Documents? Last edited by Melita-s; 15. Mar 2015 at 09:28 PM. I clicked on the Microsoft 'Get help' icon of Windows Explorer main page, then the link in the text 'Include folders in a library' and then the item ' To remove a folder from a library'. That is where it is. My Documents should contain your personal files whereas Public Documents would contain files that any user on the computer can access. See this article on Public Documents. In Widows 7, what is the default save location for downloads (determined by Windows), when a location is not specified by the user? The default is C:\Users\your name\Downloads. Thank you Joe. I have sorted out things now.